Steve Jobs Says No DRM! No DRM! The MASTER of marketing, Steve Jobs of Apple has put out a call to the big four music companies to allow them to sell DRM free music in the iStore. I have not heard a truer statement in awhile than this one, “So if the music companies are selling over 90 percent of their music DRM-free, what benefits do they get from selling the remaining small percentage of their music encumbered with a DRM system? There appear to be none.” It is completely ridiculous that the music companies require all online music stores to “protect” the music with a DRM, these stores would be perfect without it, as you could buy one or two songs from a CD instead of buying the whole CD. This is how it should be and I bet the increase in the number of songs purchased to increase dramatically. It will be interesting to see how the music companies, Universal, Sony BMG, Warner and EMI, respond to this call for action, if anyone can get people talking about something, it is Steve Jobs. 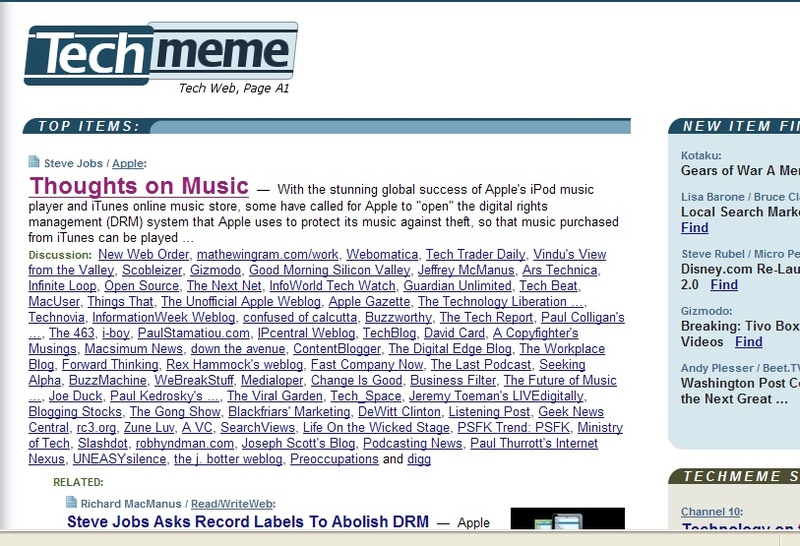 Take a look at the picture below, it is a screenshot of Techmeme, an online news aggregator that tracks news stories. Usually when a post is featured on the site it only has a few sites talking about it, some big stories will have 20 or 30 sites talking about it. This post by Steve Jobs has probably three times that many sites discussing it. It’s easy to go on record and make sure everyone remembers that the music companies are the bad guys, hehe, Bill Gates has already gone on record as hating DRM, and the music companies are probably going to do it anyway, and they have already made billions with DRM. Plus, he reinforces the view that he and Apple are the cool people, sticking it to the man. However you look at it, no DRM sounds really good to me. No DRM! No DRM! No DRM! Another battle lost by Microsoft. In the latest defection, Vic Gundotra, has jumped ship to Google, he will apparently take a year off, to make sure he clears the non compete agreement and then go to work for the search engine giant. It hasn’t been a good month for Microsoft’s Google-fighters. So bad that one left abruptly last week, and another decided this week to switch teams. Vic Gundotra, a general manager for platform evangelism at Microsoft and a 15-year employee, has agreed to join Google after first spending a year working on charitable endeavors, Business 2.0 has learned. Is there a brain drain going on at Microsoft? It sure looks that way but keep in mind that Vic and I didn’t write code. We didn?t make the products. Those of us who whether deserved or not become public faces of companies can wildly change the perceptions of those companies. There are 60,000+ people working at Microsoft. Not two or three. Or even 15. What’s ironic is I met quite a few employees at Microsoft who used to work at Google. No one talks about them. Microsoft on Wednesday shuffled around several more executives as part of its ongoing restructuring of the company. In the most significant of the shifts, senior vice president Orlando Ayala will move from his role overseeing sales to small and midsize companies into a new position overseeing emerging market efforts, reporting to Chief Operating Office Kevin Turner. Eduardo Rosini, who headed Microsoft’s Asia-Pacific unit, will take over Ayala’s role as head of the small and midsize unit, which also oversees Microsoft’s partner network. Stuff be happening, but I guess if it didn’t, there wouldn’t be any news.